If a channel breaks out, it goes where? 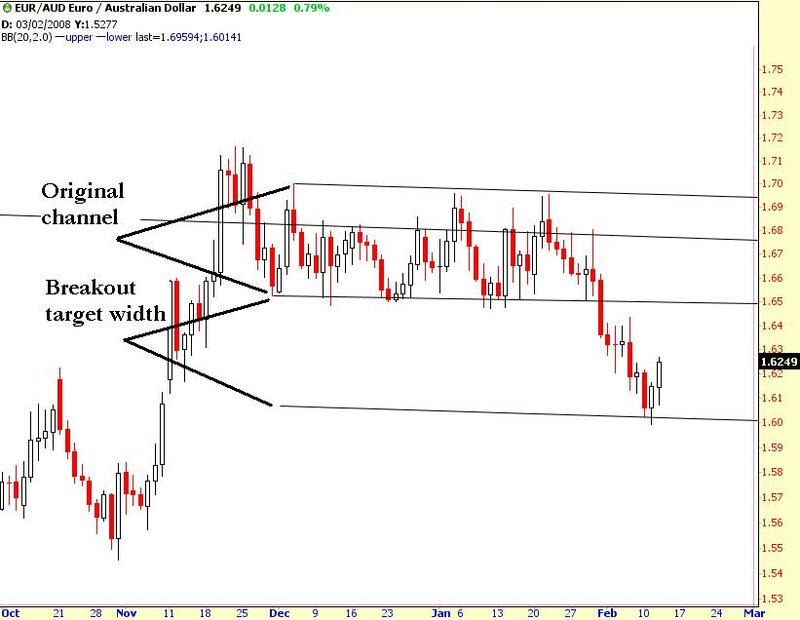 Despite my reservations about going short the euro, the EUR/AUD breakout we looked at had legs. A few hundred pips worth of legs. It’s a good reminder of a technical analysis principle some of you may not know. When price is in a channel (support and resistance running parallel) and breaks out – either way – the price will typically go at least as far from the breakout as the channel was wide. Look at the chart to the left to help illustrate that. I almost said something about this in the original post but didn’t, not wanting it to be too long. You may also notice I changed my original resistance line. I did that a few days ago upon looking at it closer. Always be willing to change those lines!